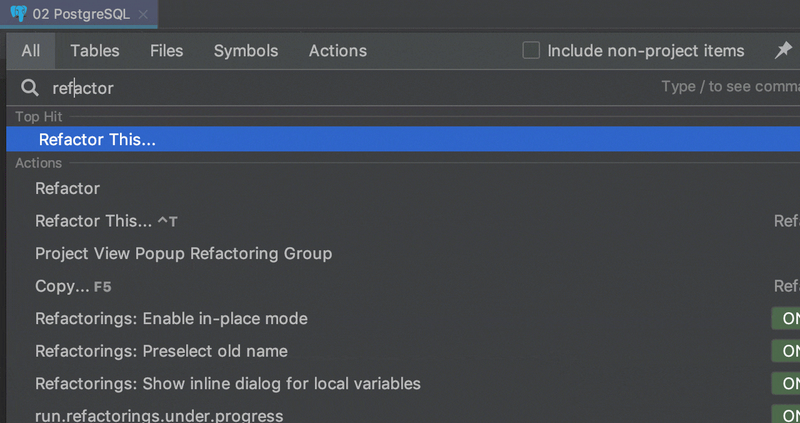 Honestly with no exaggeration: this is the most important feature in IntelliJ-based IDEs. Find action (Ctrl+Shift+A) will lend a helping hand when the going gets tough. 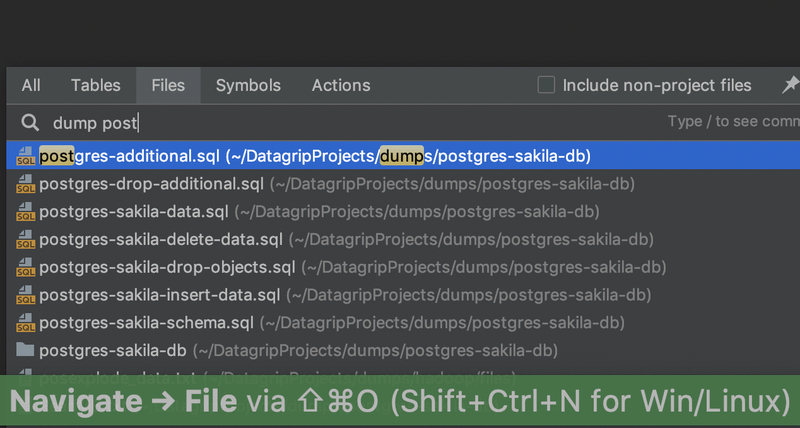 If you know something is possible in DataGrip but you don’t know how to access it, just type it here. For instance, if you forget how to open a new scratch file, press Ctrl+Shift+A, type “scratch file” and press Enter. Voila! — Edit source (F4) will bring you to the data, or DDL in case of routine. 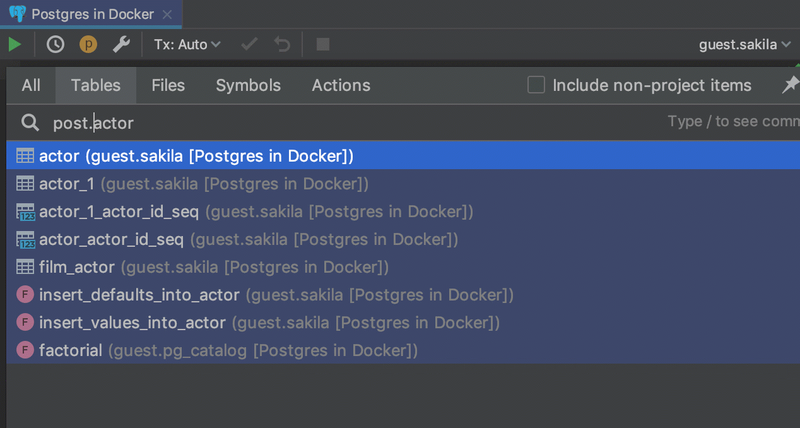 — Select in database view (no shortcut, assign your own one or use Find Action). 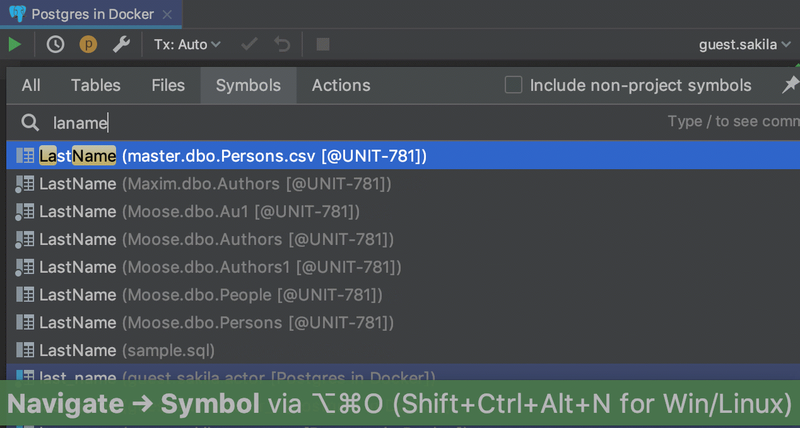 Any tree (list, pop-up, drop-down) in IntelliJ-based IDEs supports the speed search. Simply start typing! 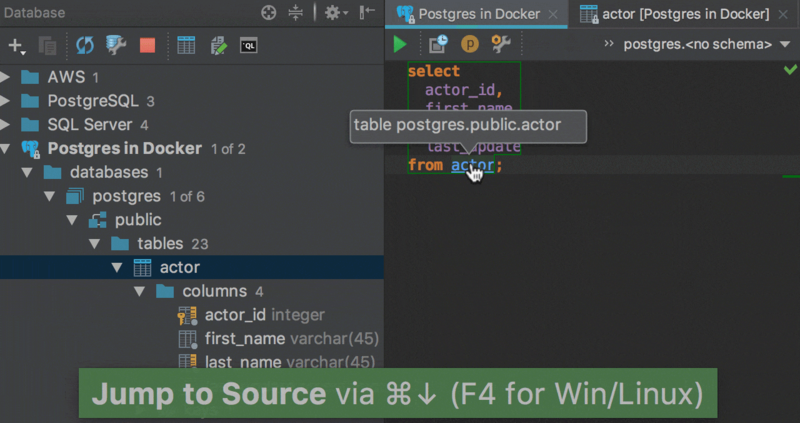 Note though that a matching database object will only be highlighted if its node is already open. Another nifty thing about speed search is that it supports abbreviations. 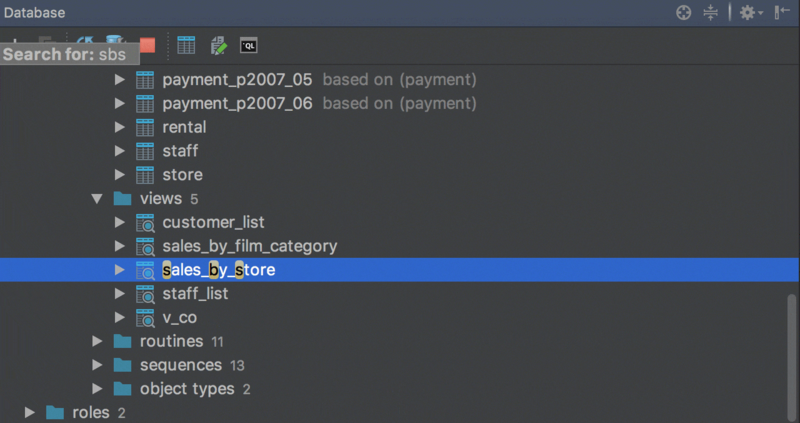 For instance, `sbs` is enough to find `sales_by_store`. When navigating to a procedure or function, you’ll jump straight to the DDL statement. Press Shift+Ctrl+N to search for a file. A file itself will be opened. If you you want to see in it Files tool window, turn on Auto-scroll from source (Gear icon in Files). 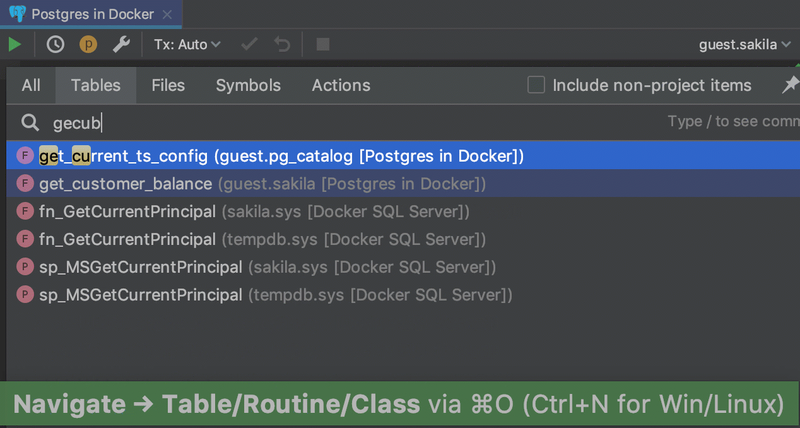 Navigating to symbol with Shift+Ctrl+Alt+N provides the possibility to get to any database object in the database view, including, columns, constraints, indexes etc. Remember about options which define where you'll be navigated. — Navigation to the table/view by Ctrl+N. — Navigation to the column by Shift+Ctrl+Alt+N. 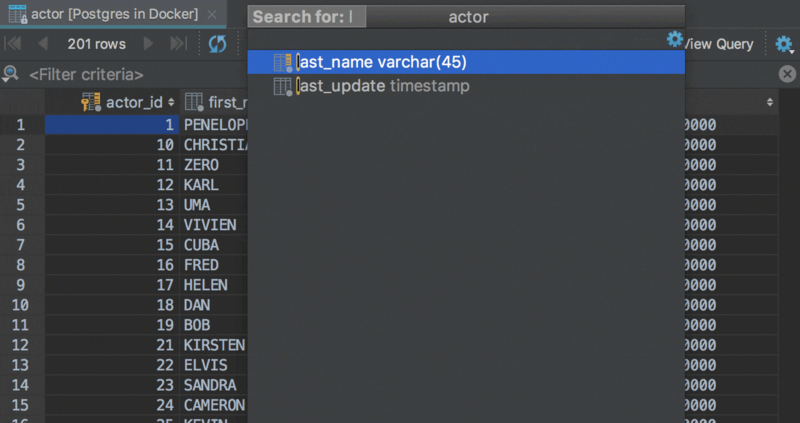 — Double-clicking on the table/view or column in the database tree view. Prefer database view instead of DDL defines where you’ll be taken when you click Navigate to declaration (Ctrl+B or Ctrl+Click) from the SQL. A small tip for when you are searching for the columns in any result-set or table. Open Structure view by Ctrl+F12 and start typing! Speed search saves you again and filter the columns. Press Enter to navigate to a particular column. If you’re not sure where to look for whatever it is you need, try pressing Shift twice to Search Everywhere.